I can eat this for breakfast, lunch, dinner and supper. Unfortunately for me, this place usually shuts by lunch time. And that is if you are lucky, since it tends to run out by late morning on weekends in particular. This is a no-frills coffeeshop that serves porridge with an assortment of stuff – your pick: pork slices, fish, innards, egg. You can have them individually or all together. 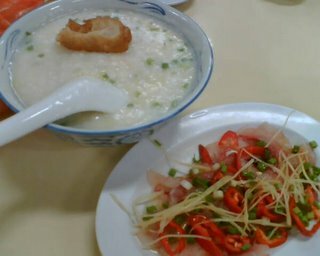 My preference, plain porridge that is nice and thick, with an egg and eaten with plates of yu sheng (raw fish). The raw fish is quite an acquired taste – I recall younger days when I felt sick at the first bite. Today, just slap on the cut chilles, a dash of pepper, a dash of soy and the dish is oh so divine. I usually add to this, pieces of you tiao (dough fritters) as well. The crunchy you tiao in the porridge lends the porridge yet another taste dimension. Divine.